This intro track prepares us for what we can expect to hear on the E.P. An interesting intro of male orchestral vocals makes us wonder if there’s something different about this E.P from the tracks released previously. It quickly breaks into a heavy background riff with Jay and Ben delivering some fast vocals. There is a short melodic break before its drops into some heavy dissonant chords, an addition to the previous open note version. It settles into some ambient picked chords with short stabs summoning the head banging! Have to give it to Tim on this one for laying down some vocals of his own to open the track. They fit really well, and tie the song back to other bands on the scene such as Heart of a Coward (Ben and Tim’s ex-band). Back to the grime style now as Jay and Ben produce some lyrics in a rhythmic style that compliment the rhythms of this track. Might have to create a groove button for 1:53 on this track; definitely one that causes crowds to nod simultaneously. Tim uses the 8 string to its full potential with some massive chords that fill out the mix extremely well. The lows cut through just as well as the highs. This is the part just before his cleans enter again. Another heavily gated part leads us out in the Hacktivist style we know and love! My jaw dropped when I heard the album version. Having been used to the previous release, I was not expecting it to be mixed too differently or new parts to be added! The drums in this track laid down by Richard particularly stand out for me in this track, it makes the track sound so much more powerful. I can almost mime the words to this now I've enjoyed it so many times! Just before the mellow interlude half way through the song, Tim shows off both his writing and production skills; using gates again, and off-beats to create a contrast. “I think that you have bitten off more than you can chew” is part which is the epitome of this track, and maybe this E.P. Ben takes his turn in kicking off the track this time, with Jay providing the response. I think Ben is more dominant on this track. This track includes the heaviest riff of the album – it’s brutal! Bending and releasing of the first fret of the low E by the sounds of things, such an awesome tone! This is quickly contrasted with the second verse; it’s quite mellow and predominantly driven by drums. Now time for another head banging groove at 2:20 – has a great response at Hacktivist gigs. The instrumental from here on in is phenomenal, so melodic and yet still driven by rhythm, pure writing genius! I love the drum groove which leads it perfectly into a chorus including vocals from Tim again. It’s a great climax and the way it all comes together to end the E.P is fantastic. 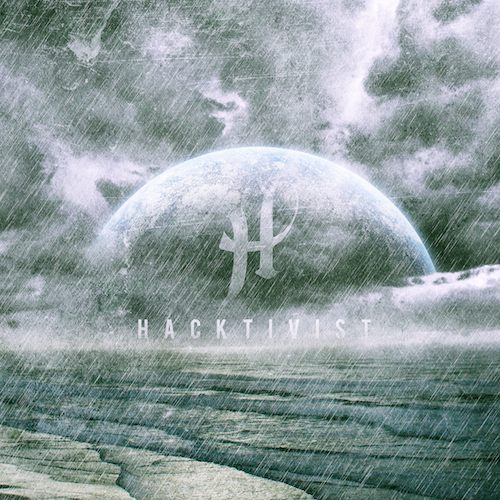 In summary then, Hacktivist have put together a brilliant E.P full of groove and grime – a milestone in this combination of rap/grime/djent. Good job guys, keep at it and we’re looking forward to the album!